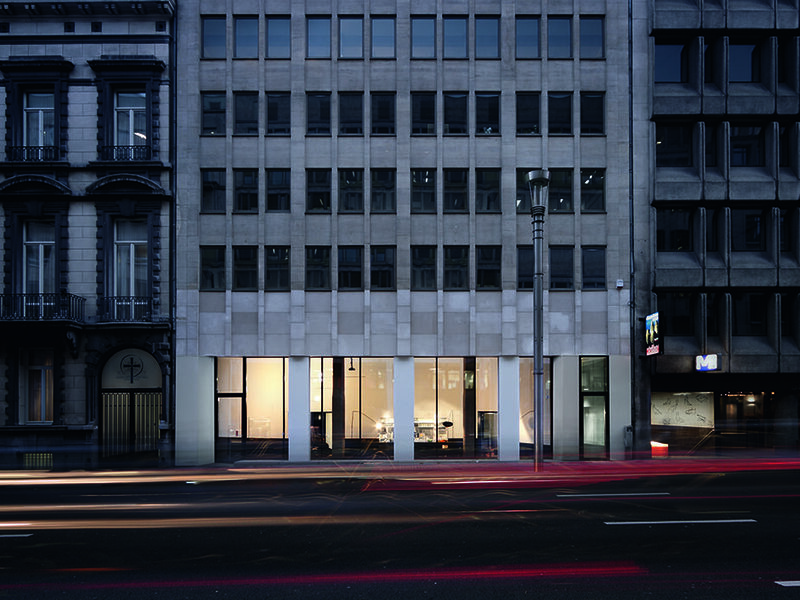 The 51N4E architectural firm carried out the conversion of the head office of the Flemish Christian Democratic Party (CD&V) in Wetstraat in Brussels. This design assignment may, at first sight, hardly seem to be front-page news — several head offices are housed in Wetstraat — but the result is nevertheless quite striking. Not least because of its unusual name, Wet89, which refers only to the street and the house number and appears to have little to do with its political occupants. Its high-class design also initially distances itself from any explicit references to the ideology and power concentrated within these offices. What is more, the schedule of requirements for this party head office has been extended to include extra space for related organisations and above all a place for public eating and drinking: the ‘Wereldsalon’ (world lounge). By renovating the worn-out and outdated party offices in Wetstraat, the CD&V now occupies an exemplary position in the centre of national and European power. Against the background of the monotonous office façades that adorn this street, and the never-ending flow of traffic it has to cope with every day, Wet89 is striking for its elegant lightness and openness. The old, low concrete structure — originally considered a reason to demolish the whole building — turned out to be no obstacle to the design of stylish open-plan offices bathed in generous natural light. The soulless and anonymous location itself — initially seen as a reason for moving — turned out to possess numerous possibilities for the design of a warm home base for the party and a unique urban location from which to watch the life of the city. A clear organisational structure was applied to the office building, rising gradually to the chairman’s office on the top floor. The intention was to make the sections of the party visible, even in the level of finish. The chairman’s floor also houses the offices of his immediate staff, an agreeable closed waiting room and the stately meeting room for the heads of the party. It is also striking that a lounge and a bedroom are included like a film set in the chairman’s office. Equally intriguing is the ingenious circuit of revolving doors that eases diplomatic consultation at the highest level. Below the chairman’s floor are three floors of office, meeting and library rooms for the various departments and administrative sections. Although the open-plan offices create the best possible atmosphere for collaboration and meeting, ceiling-high cabinets provide appropriate visual screening and glass panels give acoustic separation. The first few floors are let out to related organisations. The exception to the rule is the Wereldsalon, which is the place on the ground floor, with its entrance on the left of the façade, that defines all the rest. The visibility and accessibility of this independently run breakfast, lunch and tea room spontaneously make it a unique vestibule to the head office. The relatively small area of the café is compensated by a striking, curved finish to the ceiling that extends over two storeys. The actual reception desk is hidden away slightly to the right of the café, in a continuation of the vivid orange, almost red, hallway that leads to the lifts, staircase, press room and rear building. The rear building also contains the underground car park and the large conference room. The press room and the rear building were not included in the major renovation, but were just tidied up a little. 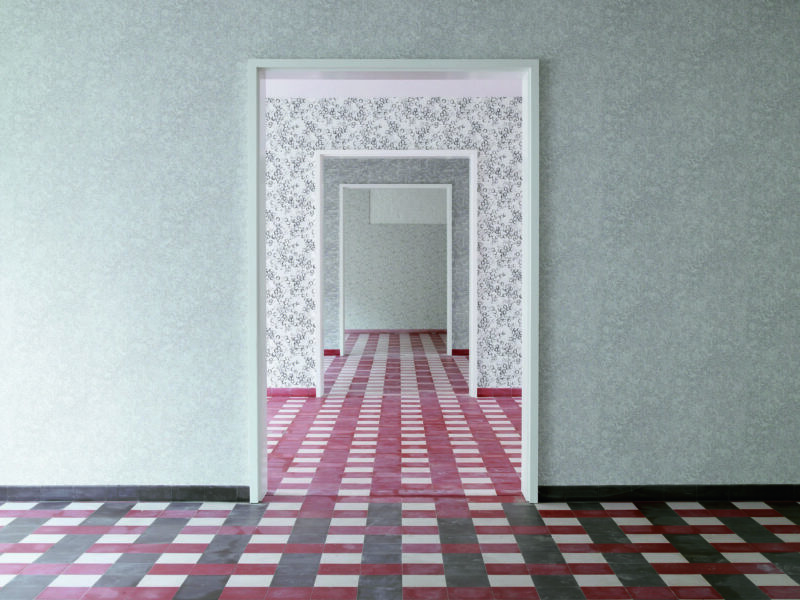 An internal passage from the Wereldsalon to the press room makes the informal meeting of press and party members more relaxed. Wet89 displays, in every aspect, a great awareness of the social impact of building projects. For instance, the client opted for a sustainable approach to this barely forty-year-old office building by renovating the façade and re-using the concrete structure, in spite of several inconveniencies this entailed. Attention has also emphatically been paid to the part architecture plays in the mediation of established social relationships. The Wereldsalon in particular turns out to be a unique meeting point where staff, representatives and party members gather and stay put. Apart from this, it is also striking that Wet89 benefits not only from the advantages of its location in Wetstraat — mainly when it comes to mobility, the proximity of the institutions and clear visibility — but also fully participates in the life of the city. With this Wereldsalon, Wet89 big-heartedly gives an extra attraction back to Wetstraat that is greatly enjoyed by the many visitors from the neighbourhood. The integration of concerns that lie beyond the scope of the actual assignment (the creation of offices with the necessary floor area) is the natural consequence of the architectural reflex that governs the client’s actions. 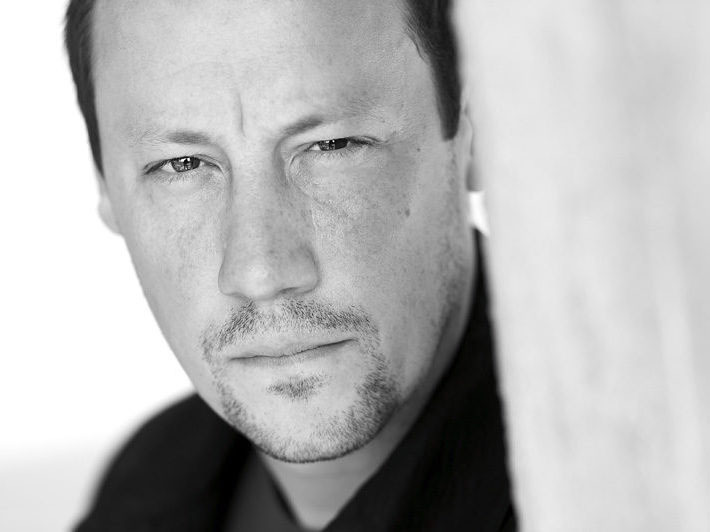 The then chairman of the party, Stefaan De Clerck, had already proposed giving priority to the new party building at the same time as the renewal of the party and the change of name. These intentions were adopted under the chairmanship of Yves Leterme and linked to the formation of a cartel with the Flemish nationalist party N-VA. Ultimately it was under the chairmanship of Jo Vandeurzen that it was decided to convert rather than build something new. 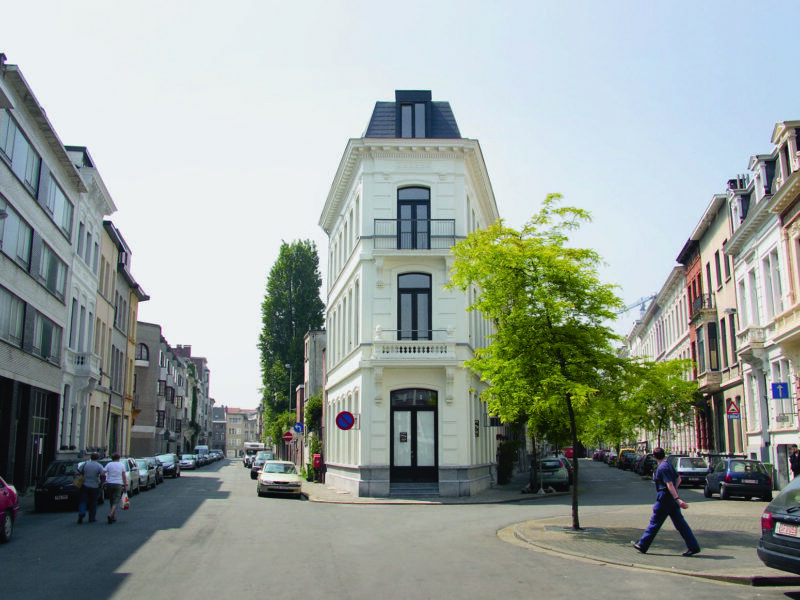 The architectural renewal of the party was entrusted entirely to the general secretary, Pieter Demeester and — through the intercession of the then Flemish Government Architect Bob Van Reeth and Jan Bruggemans — the then promising Brussels architectural firm 51N4E. 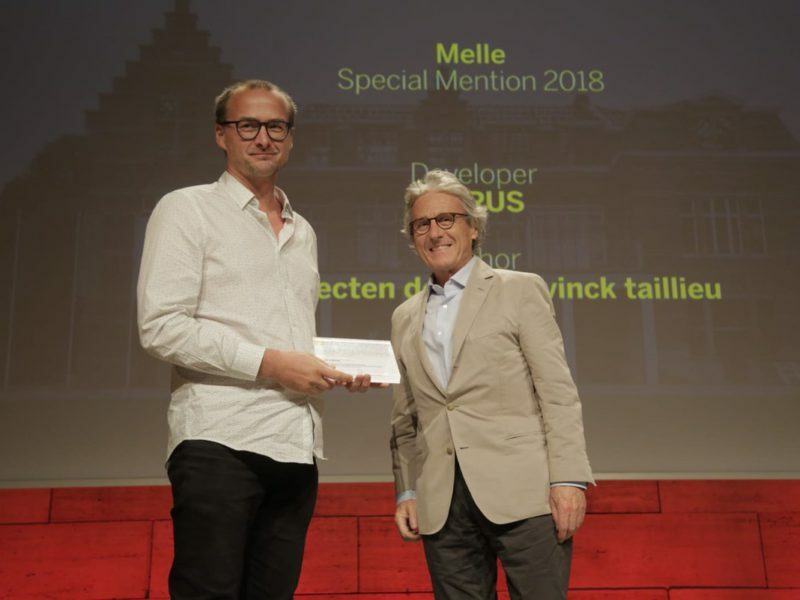 These architects were already involved in the search for a new building that was intended to bring the party closer to the average Flemish voter. They initially had their eyes on a building in the then still dilapidated Ravenstein Arcade, which is where the idea arose of including a bar in the schedule of requirements for the offices. The CD&V is not the only political party to seek architectural quality. In 2003, the French-language socialist party (the PS), also called in Base Design together with the Lhoas & Lhoas architectural firm from Brussels for the renewal of its head office. The 1964 modernist building by Maxime Brunfaut was given an extra red tint to make it even more of a showcase for the party. The ground floor was also expressly arranged as a platform for (press) conferences with red partitions and man-sized party logos. Lhoas & Lhoas’ architectural design is in this way clearly conceived as an instrument of benefit to the media interests of the PS. At Wet89, by contrast, the architectural quality itself is the main concern and the appeal of the party is more of a pleasing extra. All the designers’ attention is focused on the creation of a stylish work environment whose daily users feel good, and not on the design of propaganda. Simply giving priority to architectural quality rather than the ideological needs and desires of the client solves the usual tension between a building’s use value and its logo value. If too much attention is paid to the appeal of a building, this is usually at the expense of its daily use. Wet89 is able to perfectly side-step any discrepancy by making the high-level user-quality of the building itself the basis of its mediagenic allure. The complete absence of propaganda in its design (colour, logos, banners and cheap slogans) appears to break the ice for all its users. After all, the negative connotations usually attached to the head office of a party in power are here swept aside by the appreciation of the building. Both habitués and outsiders identify Wet89 as a hospitable place with cooperation at its heart, rather than as an inaccessible bulwark that watches over ideological purity and distributes mandates. So in the first place this renewed head office aims to appeal within party ranks. This is logical, since it is of far greater advantage to a political party to convince its own members of its credibility than to attract the attention of the anonymous and often distracted passer-by in the street. Architectural quality is a suitable means to this end, because it wins people over in their everyday involvement and well-being. This sort of spontaneous identification is something an ideological discourse is incapable of and which absolutely cannot be achieved by a display of power. In this way, at Wet89 we see the added political value of purely architectural interventions. Openness was of primary importance in the design of the office floors and the Wereldsalon was intended to be a public place — these are two of today’s architects’ hobby-horses. The architectural quality of Wet89 would be impossible without a client who turns out to be able to transcend immediate ideological preferences and stylistic features. This attitude is usually called good clientship. The crucial thing is that the architect is given the elbowroom needed to guarantee the architectural quality of the design. After all, the more the political logic in the design fades into the background, and the architectural quality comes to the fore, the more added political value is generated. In the design for Wet89, the client very much respected the architect’s independence by picking up the complaints made by the staff, but not necessarily responding to them. Participation was also limited to one single gathering. It turned out to be essential to insulate the architect, to avoid party colours and logos creeping into the design, the usual partitions breaking up the open-plan offices into cubicles and also the public Wereldsalon being watered down into the obligatory political talking shop. In the design for Wet89, the client combines exceptional respect for the independence of the architecture with a watchful handling of the added value that arose out of it. Such an exemplary attitude on the part of the client is, however, not possible if it is not accompanied by something one might call ‘good architectship’. While, regarding the design, the client censors himself in favour of the architect, for the architect it is equally essential to be aware of the implicit preconditions and expectations that are transferred into the design assignment. 51N4E fully appreciated the broadening of CD&V’s horizons by taking very literally the aim of creating an open house and at the same time distancing themselves sufficiently from ideologically tinged motives. The businesslike design of the offices and the addition of a neutral lunch bar responded well to the CD&V quest for confidence and credibility, both within the party and for the outside world. Although these expectations cannot simply be put into words in a schedule of requirements, with hindsight they turn out to be an essential part of the desire a new party head office. So the unique architectural quality of Wet89 does not necessarily emerge from any ideological kinship between architect and client — this matter is not touched upon. What is clear, however, is the mutual respect for the inherent individual logic characteristic of the architectural and of the political discipline. In this respect, 51N4E expressly presented itself as a provider of identity, who hands the client an instrument without worrying about the way the client uses it. What 51N4E is concerned with here is injecting this neutral conversion with a personal fascination for urban space and much less the political gain the client draws from it. On its side, the CD&V, as a client, radiates complete confidence in the power of architectural and spatial quality. 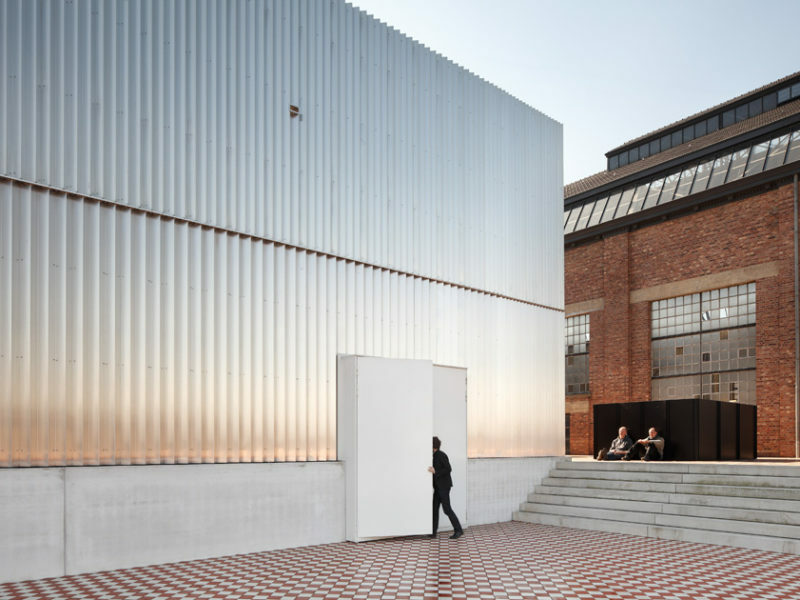 After all, what architecture gives the client is a contribution not so much to the portrayal of its familiar political identity, but to keeping alive the vital process of renewal and expansion. So the result of this positive cooperation will never be a feeble compromise — in this case between the architectural concept and the political context. What arises is a win-win situation where the client and the architect satisfy their mutual interests and fascinations by stimulating each other to go to the extreme, each within their own discipline.